As a “full-cycle” space research institute, LASP is involved in all aspects of space exploration. Our scientists consistently seek answers through new discoveries and our engineers build, test, and calibrate the necessary hardware to maximize scientific return. In the end, however, the primary focus of space missions is not the excitement, adventure, or challenge of designing and launching spacecraft: it is the many years of scientific data they return to us, and the information scientists draw from this data. According to Bill Possel, Director of MODS at LASP, one of the most exciting and unusual aspects of spacecraft operations at LASP is the opportunity for CU undergraduate students to become certified mission operators. 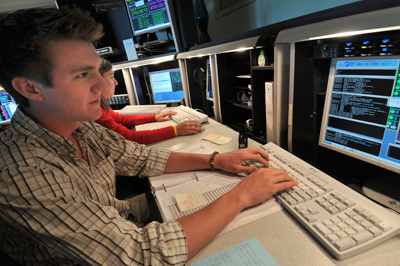 LASP student operators, who must pass a summer-long course held at LASP, work under the supervision of professional staff to operate over a billion dollars worth of spacecraft. “It’s a win-win for NASA and our students,” Possel said. LASP currently operates 4 NASA spacecraft, including the AIM, Kepler, SORCE, and QuikSCAT missions, and 14 space science instruments. Over the past 15 years, LASP has been responsible for operating over thirty spacecraft and instruments from our facilities.